Have you recently worked on a project related to Car HMI features, systems or technologies? Did your project accomplish outstanding results or promises to achieve great outcomes? 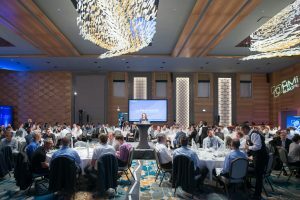 Then join us for our Car HMI Award ceremony in Berlin and share your success. We are inviting all global industry leaders and pioneers to apply with their HMI concepts and showcase their outstanding achievements. 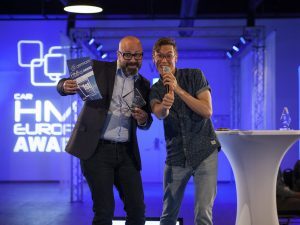 Based on all entries, the jury will nominate 3 HMI projects in each category, which will get the unique chance to be present during the official Award Ceremony & Networking Dinner on July 1, 2019, in Berlin. All winners will not only receive a certificate and an exclusive trophy but we.CONECT will also donate € 1,000 to a charity of our choice. Apply now for the Car HMI Award and get recognised for your achievements. Click on the link below, select a category and fill in your project information. 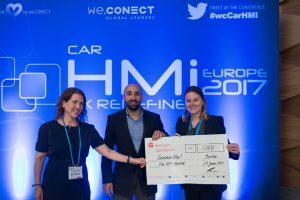 The winner of the Car HMi award 2018 in the category ‘Most Innovative Development process’ was Eindhoven University of Technology with their project ‘Scribble.’ – a haptic interface that lets you draw your way through traffic. 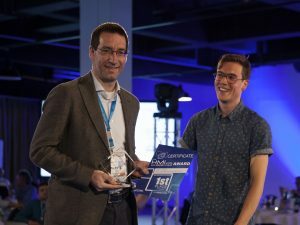 The 2nd place went to Rightware with their project ‘Kanzi Maps’ and the 3rd place went to Arbe Robotics with their project ‘Ultra High Resolution Radar’. Proud winner of the Car HMi Award 2016 in the category ‘Best Collaboration partner for developing HMI technology’ was SoftKinetic. Their DepthSense® Time of Flight (ToF) sensor and human tracking library offers the luxury of gesture control inside the automobile. It was introduced in the BMW Series 7 vehicles in October 2015 and provides accurate hand as well as gesture tracking and robust detection of both static poses and dynamic movement. 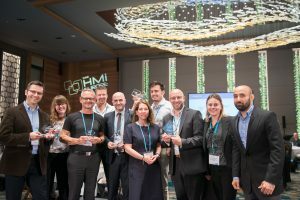 The Car HMi Award 2016 in the category ‘Most user-friendly HMI feature’ went to Mercedes Benz for their project ‘Steering Wheel Touch Control for BR213 (E-Class)’. The Touch Control was developed as an innovative input device for the steering wheel. Based on an optical sensor, it detects finger movements on its surface with high resolution and enables a reliable, fast and precise operation while driving. The steering wheel Touch Control had its public world premiere on the CES 2016 and is now available in the new Mercedes-Benz E-class. 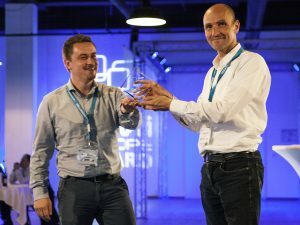 The award in the third category ‘Most innovative HMI feature’ went to Volvo Construction Equipment for their project Volvo Co-Pilot, which is a collection of applications that live in a touch screen in the cab, designed to help operators increase quality and speed while working in a safe and user-friendly way. The development of Volvo Co-Pilot is the first step towards an integrated holistic solution for work site optimisation. Volvo Co-Pilot consists of four key applications: Dig Assist, Pave Assist, Compact Assist and Load Assist. 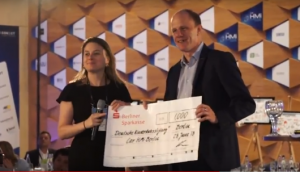 Charity Partner 2017 – GermanNow! With more than 1,000 volunteers in Berlin, GermanNOW! ensures that refugees get access to basic German language skills for free, regardless of their country of origin or official status. The lessons are taking place in the emergency shelters inside a former department store in the Karl-Marx-Str and in the hangars of Tempelhof airport, the latter being one of Germany’s largest refugee shelters. The project was established in September 2015 in the gym Jahnsporthalle. GermanNOW! enables immediate first contact with the German language right after the refugees’ arrival at emergency shelters and focusses on teaching basic, conversational German for refugees’ daily lives in Berlin. Their interaction concept in small groups allows an intensive learning process. 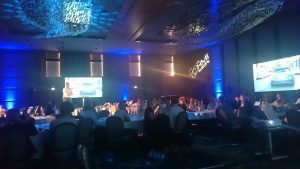 Charity Partner 2016 – Sozialhelden e.V. We have selected Sozialhelden e.V. as our Charity partner for 2016. The initiative has been founded by two cousins, Jan and Raul. Raul is in a wheelchair himself, they both have South American roots and share a passion for social projects. They initially started with ‘Germany’s Super Zivi’ searching for the best and most motivated person to voluntarily take part in community services. After a successful project, they soon decided to set-up more initiatives. Their aim is to create awareness for social problems and ideally find ways to reduce or even eliminate them. It’s not just about having an idea, but actually going the extra mile with enough patience, strength and perseverance. We selected charity project Muzanga Education initiated by Raise A Smile e.V. as our charity partner in 2014. They support underprivileged children in rural Zambia with mobile education and teaches children how to read, write and hosts workshops on important topics such as HIV/AIDS, malaria and hygiene promotion. The video will be shown live on stage at the award ceremony on July 01, 2019. 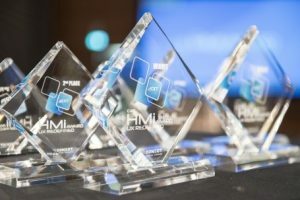 No applications for the Car HMi Awards 2019 will be considered after the deadline as indicated on the website.